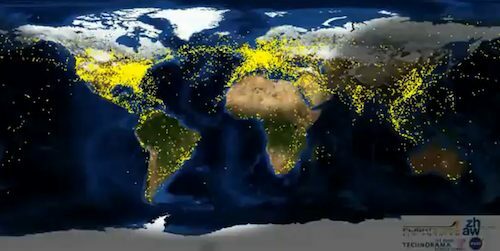 Worldwide And US Air Traffic Over 24 Hours [Video], Wow. The two embedded videos show air traffic worldwide and in the US over 24 hour periods. Viewing these astonishing images tends to leave little doubt about the significant impact human activity is having on the world as a whole; keeping in mind that this happens every day. So many flights! On another level, it reminds me of watching a colony of ants go about its business? It seems we are not so different from other animals in some ways. Notice how as the day dawns and progresses in different parts of the world, traffic increases greatly. As night falls, traffic drops off. According to NASA, in the middle of the day in the US, the number of aircraft in the sky peaks at just over 5000! Are we reaching peak air travel, given the escalating emissions situation? Will it become progressively more expensive in coming years with carbon prices around the world, and with peak oil an inevitability? A nice way of knowledge for lay man…………. Previous post: Why is breast milk ice-cream repulsive?